When the NCA & NDA Collegiate National Championship comes around, everyone is excited to see what fun their favorite furry friends will bring to the Bandshell. Joining us in person to watch the mascot competition live? Here is everything you need to know about the division. Each mascot will perform a routine lasting a maximum of 1 minute and 30 seconds not including set-up and tear-down time. You will see some helpers from each university rush to get all the props organized as quickly as possible because each mascot is only allowed 1 minute and 30 seconds total for set-up/tear down. Once on stage and ready to go, each routine will contain a theme and should include these three elements. 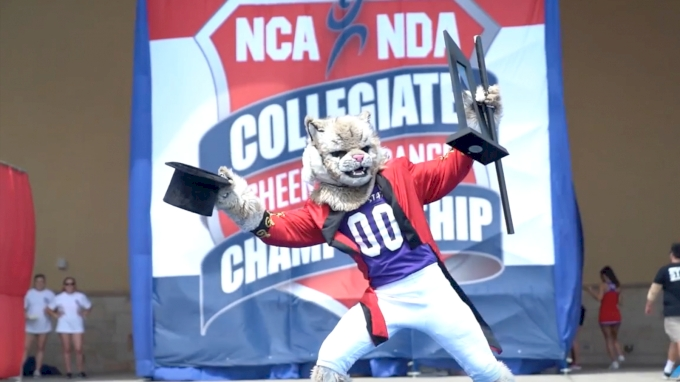 [WATCH] Highlights From The 2018 NCA Mascot Competition! The Mascots know how to bring the fun and entertain a crowd, but they need your help to bring their routine to life! Waldo from Weber State University is the reigning NCA Mascot National Champion and he will return to the Bandshell at 12:50 PM ET to defend his title. Waldo along with 10 other college mascots will take the bandshell on Saturday with the hopes of entertaining the Daytona Beach crowd and showing their fans why they love Cheer & Dance. The Mascot Performances will not be live streamed on Varsity TV but if you are joining us in person, be sure to cheer on your favorite furr friends as they compete for an NCA National Championship title!